In the past, posters of cars such as the KTM Crossbow and Infiniti Red Bull F1 would adorn the bedroom walls of teenagers who were passionate about motorsport, while solar cars were banished to science fairs as a mere curiosity. Enter the UNSW Sunswift Solar Car Team, who are looking to radically change this status quo by building eVe, a next-generation solar car that the team has described as both “sporty, efficient and beautiful”. 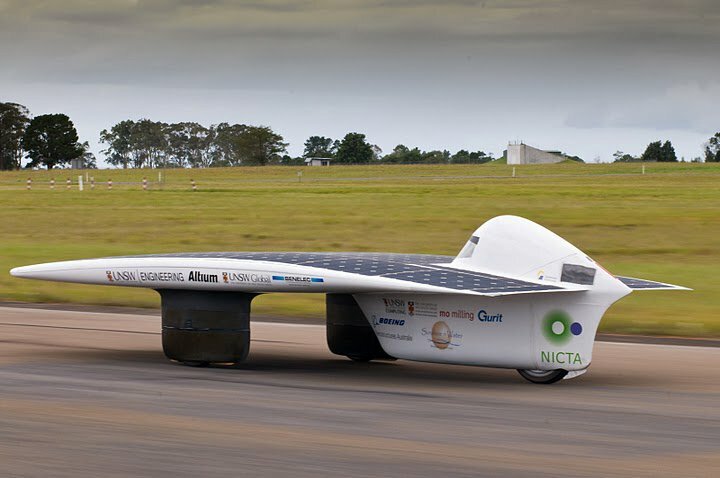 Sunswift’s eVe is entered into the newly created “Cruiser” class in the 2013 World Solar Challenge, which concludes today in Adelaide. Behind the flowing aerodynamic curves and shiny carbon fibre, eVe is a complex feat of engineering, combining the best technologies across a range of engineering disciplines (including students studying electrical, mechanical, automotive and aerospace degrees). The new “Cruiser” class is a departure from the typical solar car concepts which are often driven entirely by aerodynamic concerns (see 2011 Sunswift car at right). Instead, teams participating in the new “Cruiser” class are aiming for the optimum combination of both speed and practicality, with the cars being required to meet all requirements for road registration in their country of origin. To do so, the UNSW Sunswift team had to carefully refine every component on the car in order to achieve maximum overall performance, whilst maintaining a number of ‘practical’ features that every-day motorists would typically expect such as 4 wheels and at least 2 forward facing seats (and struggling with the challenges that these additional constraints bring; such as greater frontal area, frictional drag and weight). Avid readers of this blog will know that even with the most efficient solar cells and powertrain, a solar car will struggle in the World Solar Challenge if much of this power is consumed overcoming aerodynamic drag. At speeds typically exceeding 100 km/hr (and reaching up to 127 km/hr in optimum conditions during the race), the aerodynamic drag profile of these solar cars becomes the largest contributing factor to overall efficiency. Ultimately, the first “Cruiser” class car to reach Adelaide will no doubt be the design that is able to match other teams on speed during the race, whilst preserving sufficient battery power to maintain their speed through any extended cloudy periods. 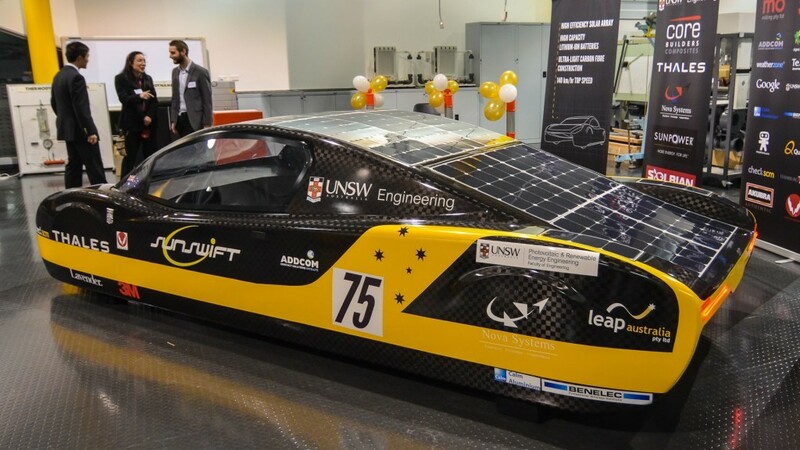 There is no doubt that the engineering challenges (and compromises) are significant, and it is also worth noting that university organisations, such as UNSW Sunswift, often lack the financial resources and time to conduct elaborate physical prototyping and testing. As such, simulation-driven product development strategies with ANSYS are used widely to provide detailed engineering insight into the car’s performance, allowing the team to rapidly consider tens or even hundreds of design variations at minimal cost. The UNSW Sunswift team worked closely with LEAP Australia to leverage the use of world-leading CFD software and training expertise to minimise the aerodynamic drag of the eVe car for the range of expected highway speeds (and thereby maximise efficiency whilst balancing other design constraints). Additional challenges also thrown up by unpredictable weather conditions require the team to carefully consider the aerodynamic and roll stability of the car, which could potentially limit the maximum speed at which the car can be driven during dangerous cross-winds. Leveraging the automation within the ANSYS Workbench (to consider numerous parametric inputs), and best-in-class scalability through high-performance computing within the ANSYS CFD solvers, has meant that the Sunswift team’s aerodynamicists could systematically produce accurate aerodynamic evaluations of numerous potential designs within the limited timeframe available to them. We are pleased to report that Sunswift eVe was recently the first cruiser car into the final control stop at Port Augusta, ahead of their main rivals: the cruiser teams from the Netherlands (Eindhoven) and Germany (Bochum). 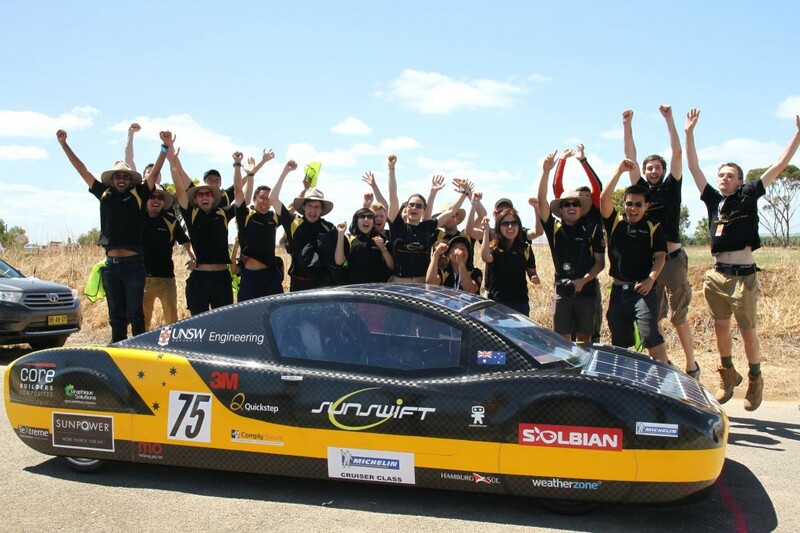 As all cars begin to pull into Adelaide to complete their epic voyage, we congratulate the UNSW Sunswift team and all other participants in the 2013 World Solar Challenge. Wherever their future engineering careers take them, here at LEAP we are sure that this will prove to be an invaluable experience and that many of them will be able to utilise their well-honed CFD/CAE skills to design a myriad of exciting and innovative new products. All images courtesy UNSW Sunswift. University of Toronto Blue Sky Solar Car also used ANSYS CFD.. Thank you for your complement and we extend our congratulations to the University of Toronto Team for completing the race. In addition to the UNSW team mentioned here (with which LEAP has a close affiliation), there are many other teams both locally and worldwide who are using ANSYS software to investigate and optimise the complex aerodynamic, structural, and electromagnetic challenges that are thrown up by the World Solar Challenge. Indeed, we look forward to seeing how the cars evolve further at the next race in 2015, and we hope to see more teams involved in the Cruiser Class so that we can assess the future impact of these novel ideas on some of the real-world OEM electric vehicles. Great post! This is some amazing information. If all the cars in the world ran on solar power, we would use so much less natural gas and it would really help the planet.